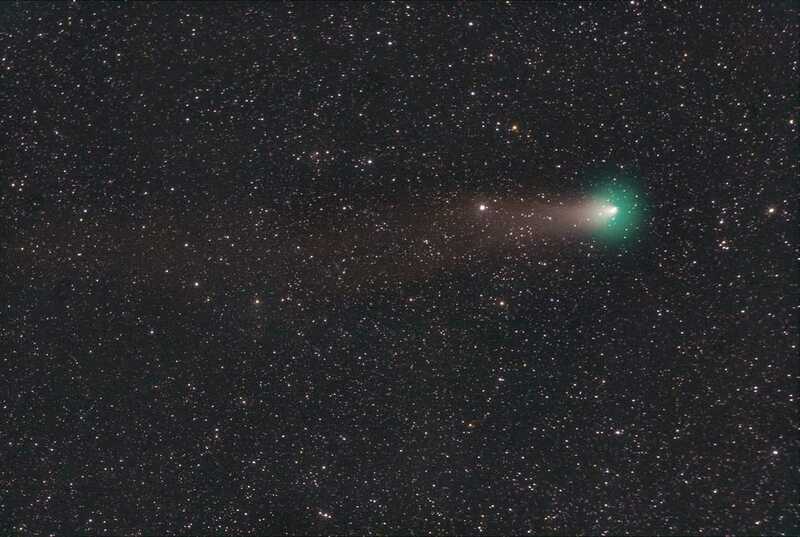 Comet Giacobini-Zinner on 14-09-2018 at aproximately 05:02:00 AM EST. Telescope used was a Meade 6″ Schmidt Newton with a Sony A6000a attached. The telescope was mounted on a iOptron CEM25P mount. No guiding. The photos were stacked manually using Photoshop CC. Then adjusted to taste in Lightroom CC. The image is oriented with north down and east right. Tail 1.3 degrees PA 275 degrees, tail may extend beyond the field of view.